Undoubtedly, India is a land where anything can and does happen! These quirky and strange festivals in India will amaze you. Some are fun, while others may leave you wishing you'd looked away. Every year, during Kerala's Onam Festival, a curious activity takes place at Swaraj Round in Thrissur. The tigers come to town! 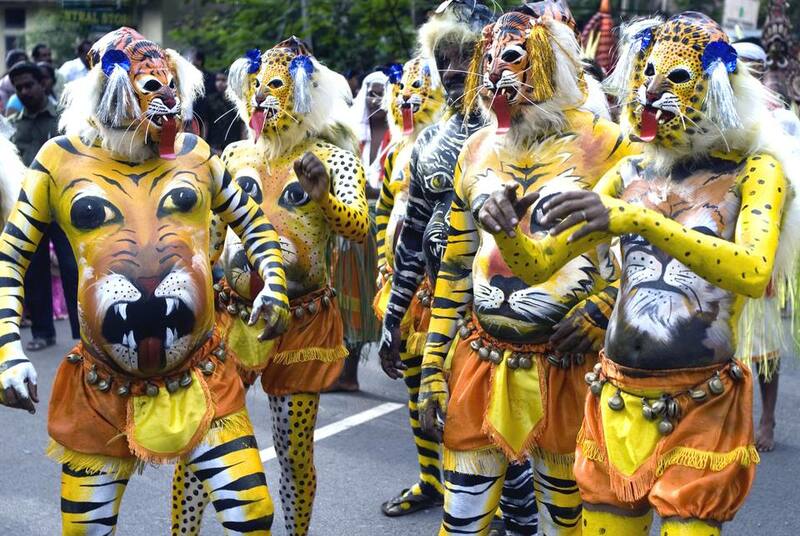 Pulikkali, a traditional Kerala art form said to have originated in the late 18th century, sees people dress up as tigers. The name Pulikkali means "tiger play" or "tiger dance", and that's exactly what these man-tigers do. The best performer is selected out of the hundreds of participants. The dressing up process is long and tiring and requires a great deal of patience. Bodies must be shaved before the first coat of paint is applied. It's left to dry for a couple of hours, and then the second coat of paint is put on. Dancing like a tiger while dressed up in such a manner is no easy feat either! When: In August or September. How to get there: Thrissur is located in central Kerala, in southern India. It's a two-hour drive from Kochi. You can also travel there by train and bus. Swaraj Round, or Thrissur Round, is the local name for the circular road around the center of the city. Where to stay: The reasonably priced Hotel Pooram International is one of the best hotels in Thrissur and is located close to the action on Swaraj Round. The Kila Raipur Rural Olympics is a rural sports festival that's grown over six decades, to become a sports bonanza that attracts competitors from around the globe. Over 4,000 sportsmen and woman participate in the festival, and they're watched by around 1 million spectators. Bullocks, camels, dogs, mules, and other animals competing in highly professional events must be seen to be believed! The adrenaline-pumping bullock cart race is the main attraction. Other events that are big on entertainment include a dog race, horse dance, camel race, tractor race, and a tug-of-war. But the chance to see some really off-beat activities is the hugest draw card -- such as people lifting bicycles with their teeth, pulling cars with their teeth or ears, or riding a bicycle ringed with a burning tire, and other daredevil stunts. The Rural Olympics really is a test of endurance, skill, and strength! The fun doesn't end at the end of the day. Each evening there's a cultural feast featuring top-notch folk singers, Bhangra, and Gidha players. The program continues well past midnight on all three days of the festival. When: Three days during early February each year. How to get there: The Kila Raipur Rural Olympics is held about 30 minutes south of Ludhiana, in Punjab. Kila Raipur is well connected by rail, road, and even air. Ludhiana is a 3-hour train journey, or 40 minutes flight, from Delhi. Delhi by Foot usually runs tours there. Where to stay: There's a good range of hotels in Ludhiana. The classy Nirvana Hotel receives excellent reviews, as does the cheaper Keys Hotel. If budget is a concern, Hotel Samrat is clean and offers good value for money. The famous 600-year-old Karni Mata temple, near Bikaner in Rajasthan, is home to thousands of rats. They're considered to be sacred and are offered food and protection. The temple is dedicated to an ancient mystic who's believed to have been a reincarnation of the Goddess Durga. Interestingly, the souls of Karni Mata's devotees are said to reside in the rats. When: The largest festival takes place in March or April, during Navaratri. The second smaller festival is held in October or November, also during Navaratri. Where to stay: It's best to stay in Bikaner, where accommodation is prevalent, and go on a day trip to the temple. Nag Panchami isn't for the faint of heart! This festival is devoted to snakes, which are especially dug out of the ground and gathered for the occasion. On the day of Nag Panchami, snake charmers display the snakes to people for worship, and villagers dance to music and carry the snakes in pots on their heads in procession to the temple. After the rituals are complete, the snakes are taken out from the pots and the temple priest sprinkles haldi-kumkum (turmeric and vermilion) and flowers on their heads. The snakes are also fed milk, as the ultimate sign of good luck. The festival has become controversial in recent years, attracting the attention of animal right's activists who say that the snakes are treated poorly and often die ​afterward. Giving the snakes milk is particularly harmful because they can't digest it. When: Every year on the fifth day of the bright half of the Hindu month Shravan (July or August). You'll be able to see more snake charmers than usual out on the streets of India during the festival. How to get there: Nag Panchami is mostly held in rural areas, particularly Battis Shirala village, Maharashtra. It's located 400 kilometers (approximately 250 miles) from Mumbai, in between Kolhapur and Sangli in Maharashtra’s Sangli district. Celebrations also take place at snake temples across India, including many in Kerala such as the Nagaraja Temple. This is one festival you won't forget in a hurry. Thousands of sword-wielding oracles, both male and female, clad in red swarm Kodungallur Bhagavathy temple in Kerala's Thrissur district. The oracles run in around a trance and flagellate themselves on their foreheads to draw blood. Meanwhile, devotees strike the temple rafters with sticks, hurl offerings, yell lewdly, and sing sexually explicit songs. It's a sight to behold. The temple is dedicated to the goddess Bhadrakali, which is a form of Kali worshiped in Kerala. Legend has it that the goddess was angry and thirsty for blood after her victorious battle against the demon Darika, and her soldiers sung to her to make her feel better. The rather intense and gruesome festival event, called kaavu theendal, is a reenactment of it. The sticks are said to resemble the swords used in battle. Afterward, the temple remains closed for a week for purification. When: During the Malayalam month of Meenam (late March or early April) every year. How to get there: Kodungallur Bhagavathy temple is in Kodungallur, about an hour northwest of Kochi airport. The nearest railway station is at Irinjalakuda, about 30 minutes away. At first glance, this image of the Bhandara Festival could easily be mistaken for Holi, when colored powder is thrown all over the place in India. However, the golden haze is actually turmeric powder -- and a heck of a lot of it! Thousands of devotees cover the temple premises in turmeric as an offering to the god, Lord Khandoba. At noon, his idol is taken out in procession with his wife Malsha to have a bath in the nearby river. This holy bath is carried out to recreate their marriage, and many believe that the turmeric ritual comes from the Hindu tradition of applying turmeric powder to the bride and groom before the wedding. Devotees sing and dance. The celebrations are not all lighthearted though. Some pilgrims undertake violent devotion (ugra bhakti) to get their wishes fulfilled, inflicting all kinds of pain on themselves such as whipping themselves in public and piercing their flesh. When: On the occasion of Somvati Amavasya. This is a new moon day (also called a no moon day) that falls on a Monday. It usually happens two or three times a year. How to get there: Khandoba temple is situated in Jejuri, about 1.5 hours southeast of Pune in Maharashtra. It's possible to visit it on a day trip from Mumbai if you hire a car. However, travel time one way will be about 4.5 hours (or more depending on the traffic). Hence, it may be more convenient to go there from Pune. The exuberant Jaisalmer Desert Festival is a wonderful opportunity to experience the sandstone city of Jaisalmer and surroundings at their magical best. You can enjoy a host of weird and wacky activities such as a parade of camels and fancily dressed locals, camel races and polo matches, turban tying competitions, and competition for the finest facial hair. The fun continues on the second day, with a host of bizarre camel related activities at Dedansar Stadium. Camel decorating, camel fur cutting, and camel polo will keep you amused for hours! In the afternoon, the activities again return to Shahid Poonam Singh Stadium where the Border Security Force Camel Tattoo takes place. Marvel over gymnastics on camelback, and camel band with formation dancing. How to get there: Jaisalmer is accessible by rail and road from Jodhpur. The journey takes around 6 hours. Where to stay: Book a room at one of the best hotels in Jaisalmer with fort views or stay at a tent hotel or desert camp. This Hindu festival is celebrated by the Tamil community and is dedicated to Lord Murugan, the son of Lord Shiva and Parvati. It commemorates the day that Goddess Parvati gave him a lance to slay an evil demon army. During Thaipusam, devotees pray to Lord Murugan and show their endurance in order to receive his grace to overcome obstacles. Some fanatical devotees go to extreme lengths to please the Lord and try to get rid of their sins. They pierce various parts of their bodies with hooks, skewers, and small lances. Apparently, the devotees enter into a trance state and don't feel pain or bleed from their wounds. It's horrifying yet fascinating! One of the biggest Thaipusam celebrations takes place over 10 days at Sri Dandayudhapani Temple in Palani, near Madurai in Tamil Nadu. The temple is regarded as one of the six abodes of Lord Murugan. Devotees walk long distances to attend, many carrying a kavadi (an offering that can take various forms such as a pot of milk or a decorative altar on a frame). It's believed that those who do so will have their life burdens lessened by Lord Murugan. When: The full moon in the Tamil month of Thai (January or February) each year. How to get there: Palani is located about 2.5 hours southeast of Madurai. It's readily reachable by train, and extra services run for the festival. Madurai has an airport that receives flights from other cities in India. Every year, the small town of Kaveripattinam in Tamil Nadu is flooded with tens of thousands of devotees who come to worship the Goddess Angalamman, who is considered to be a reincarnation of Goddess Pavarti (the wife of Lord Shiva). The goddess is an extremely fierce guardian, to be appeased with blood. Devotees, including children, paint their faces and dress themselves to resemble her before going to the temple to pray. This festival also attracts some devotees who oddly pierce lemons all over their torsos. When: The day after Maha Shivratri (in February or March) every year. How to get there: Kaveripattinam is in the Krishnagiri district of Tamil Nadu. It's approximately 2 hours southeast of Bangalore in Karnataka. The nearest railway station is Krishnagiri City Junction, about 15 minutes away. 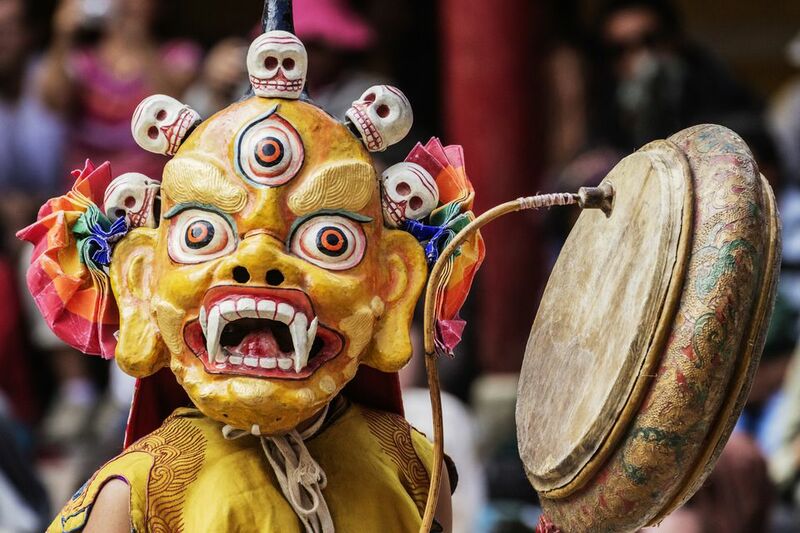 The two-day Hemis Festival commemorates the birth of Guru Padmasambhava, who founded Tantric Buddhism in Tibet. It's held at the 300-year-old Buddhist monastery of Hemis Jangchub Choling, near Leh. This monastery is the biggest and richest Buddhist monastery in the Ladakh region. When: In June or July every year. How to get there: Flights to Leh operate from Delhi, Srinagar, and Jammu. Alternatively, it's possible to travel there by road from Manali and Srinagar. The Hemis Monastery is 45 kilometers from Leh and can be reached by car/jeep or bus.